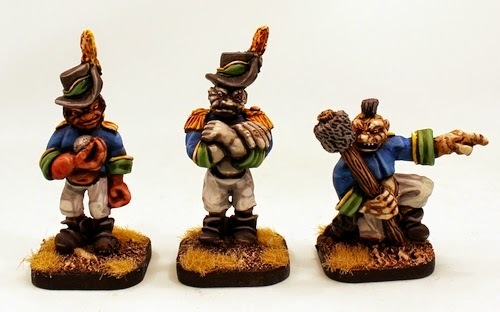 Alternative Armies: Trolkin Artillery Crew released for Flintloque and Slaughterloo! 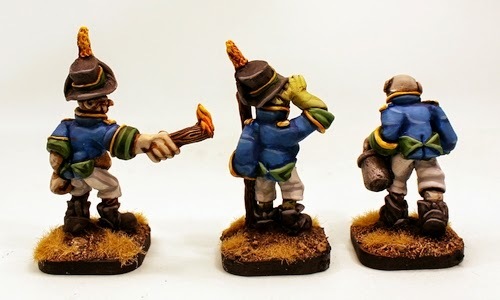 Trolkin Artillery Crew released for Flintloque and Slaughterloo! Another release for the finest black powder fantasy range in the world for use with Flintloque and Slaughterloo. Alternative Armies is proud to present to you the newest addition to the Trolkin of Copendaz range following up on the Lergo Jagers last month month we have the Lergo Artillery! Go HERE or read on for more information. We are releasing more miniatures right through the festive period until a special offer on Xmas Eve! This unit pack contains six one piece 28mm white metal miniatures and two grey tone resin 28mm limber beasts with separate white metal horns for a total of eight miniatures. This is a Trolkin artillery crew composed of an Officer (arms folded), Match (lit and pointing), Rammer (kneeling and pointing), Sponger (sponge and bucket), Ball (with cannon ball) and Trailspike (with wooden pole). 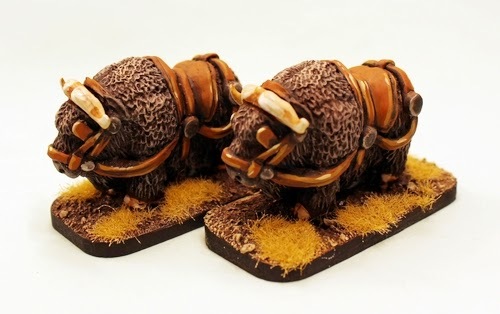 Two identical Muskox's in limber harness suitable for pulling any field gun. Each Trolkin is larger and bulkier than an Elf and stands 30mm to eye level while a Muskox is 40mm long. This code can also be purchased pro-painted and based at an excellent price. Pack price 26.00GBP. Go HERE. The Trolkin are unlike any other race on Valon they are still somewhat Magicke and their differing skin colours (from grey to red and yellow too) show this along with their distinct fashion sense. 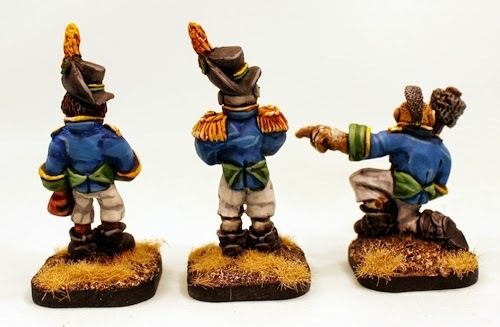 Trolkin soldiers always seem to wear uniforms that are too small for them despite their outfitter the ‘Marske’ trading company delivering as many as they need. Lergo refers to the way their troops are raised, a unique modular system that choosing the Trolkin by standard height and different colours to make up formations that can be re-purposed again and again. 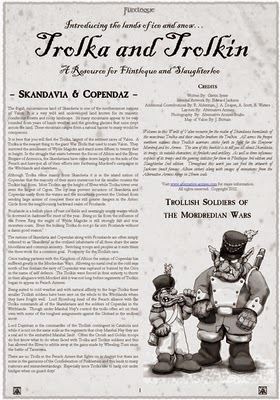 The Trolkin gunners organise themselves into the formations that the Armorican Elves use and make use typically of medium weight cannon. All Trolkin serving the guns are designated as Gunners. The gunners are armed with their normal artillery implements with officers armed with a hidden pistol too. The Trolkin Artillery uniform consists of a dark blue tunic, white breeches, a black shako and black shoes. Facing colours (cuffs, collars, etc.) are green, trimmed in yellow. Equipment is black and brown, with equipment straps being of white leather. There is a full free booklet on the Trolka and Trolkin which you can download as a PDF from us by clicking HERE. 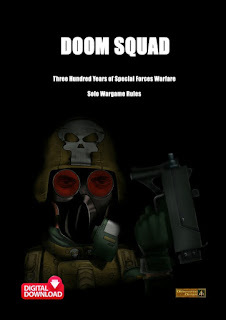 This booklet contains a full army list along with Flintloque rules, Slaughterloo rules, background, fiction, tales, pictures and much, much more in its eighteen pages. Well worth a read! The natural place for the Trolkin is in colder climes so it makes sense that the majority of their soldiers are in the Witchlands fighting against the Undead. 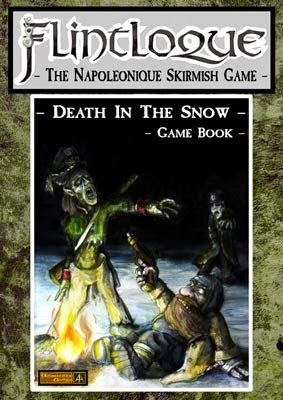 You can learn more about this campaign in 5026 Flintloque 3rd Edition Death in the Snow game book. Trolka and Trolkin enjoy some advantages in battling against Zombies and Skeletons and indeed their physical size and resilience stands them in good stead against Vampyres too. Click HERE to visit the website to read more. 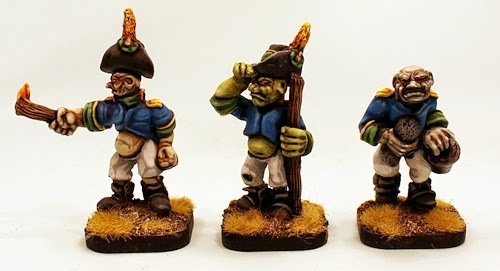 These new Trolkin miniatures were sculpted by Rob Alderman who also designed the other Trolkin codes as well as other packs in the World of Valon range.